Samantha grew up in Southern California loving animals ever since she was a little girl. When she was in junior high school, she wrote in her seventh grade journal that she wanted to be a wildlife biologist. After high school, Samantha attended California State Polytechnic University, Pomona where she received a bachelor’s degree in zoology. Samantha took classes such as animal physiology, vertebrate zoology, and environmental biology. By far her favorite class was Herpetology, the study of reptiles and amphibians. 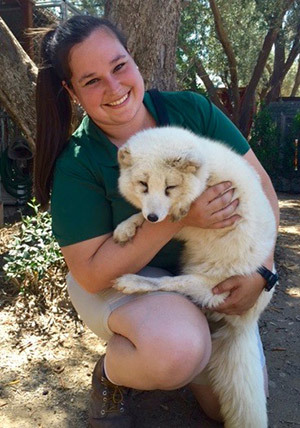 While in college, Samantha joined a club known called the “Zoologists of Cal Poly Pomona.” Samantha also had the opportunity to give tours to children at Cal Poly Pomona’s Biotrek, teaching them about the environment and the animals that live there. During her senior year, she worked with graduate students studying tide pools and the affects humans have on them. She also volunteered for three years at the Orange County Zoo, helping the zookeepers with enclosure cleaning, food preparation, and animal care. She worked with many different types of reptiles, birds, and mammals such as mountain lions and black bears. After graduating college, Samantha worked a seasonal job for the Santa Ana Watershed Association where she worked directly with brown-headed cowbirds and European starlings. This job gave her hands on experience catching and clipping wings, as well as helping regulate the population of these invasive species. Now that Samantha is a part of the Wildlife Learning Center team, she is extremely excited to share her passion for animals with others and teaching the public about the life sciences and wildlife conservation.